John Lewis' saccharine Christmas adverts have lodged it as firmly in the festive imagination as tinsel and overcooked sprouts. Scrooges, lock up your coal scuttles, grab a bowl of watery porridge, and prepare to bah some humbugs. John Lewis’ festive advert launches today, which means Christmas has officially arrived. Even though it’s early November. 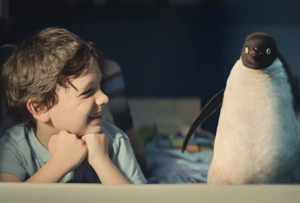 The advert features little boy Sam and imaginary penguin Monty having a great old time, until Sam realises Monty is lonely for another of his kind. In a touching display of kindness and ingenuity, Sam then purchases a penguin girlfriend for his friend (presumably from some site in eastern Europe) as a Christmas present. He even wraps her up too, which most people would have imagined was illegal. It’s really quite moving. Despite only launching television adverts in 2007, John Lewis has rapidly managed to become part of the television-viewing public’s ‘Christmas experience’. The first ones were fairly abstract, cerebral almost, as festive adverts go. The partnership soon wised up to the fact that cute kids pull heartstrings and sell gifts, however, hitting the big time with ‘The Long Wait’ in 2011. In this ad, the cute kid pines away his Advent in desperate wait, only to go straight to his parents’ room on waking on Christmas morning to give them his present. Heart-warming, if you’re into that sort of thing. The next year, John Lewis discovered that animated creatures also sell presents, launching an ad about a snowman crossing mountains and motorways to get a gift for his snow-wife, following it up the year later with an ad about some cartoon animals. By now, MT was, like everyone else, teary-eyed and ready to buy some novelty scented candles for its sister. This year, however, the partnership may well have hit the jackpot, by combining cute kids and cute animals, in an irresistible assault on your emotions (and your bank balance). Not only does the ad campaign push up sales every year for John Lewis’ vital fourth quarter (the retailer had an 11% increase in sales the week after the ad launched last year), but also it comes with merchandising attached. If you really want to, you can buy Monty teddies, Monty books and Monty goggles. You could have your picture taken with Monty in John Lewis stores, download the Monty app or even follow him on Twitter (@MontyThePenguin). If MT were the actor who played Sam, it’d feel a little upstaged right now. Although John Lewis’ commercial nous is clearly admirable, there is a risk of coming down with the dreaded Schmaltzy Christmas Penguin Fever. 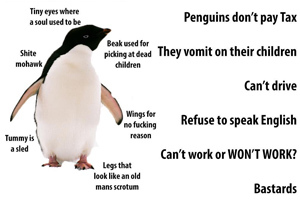 Just in case, here are a few fun facts to cure you, courtesy of @technicallyRon. Merry Christmas.